REX SMITH MANILA CONCERT LIVE TICKETS on the Valentines Day - FEBRUARY 14, 2012 at Midas Hotel Lobby Bar, Roxas Boulevard, Pasay City. REX SMITH , an American singer behind the Gold Top 10 single, "You Take My Breath Away," in 1979. REX SMITH DISCOGRAPHY in the Soft Rock Genre inludes hit songs Simply Jessie, Let’s Make A Memory, Forever, Don’t Give Up On Us, Speechless, True and Everlasting Love, REX SMITH MANILA CONCERT LIVE TICKETS Price at P 1,584 which includes 2 complimentary drinks. 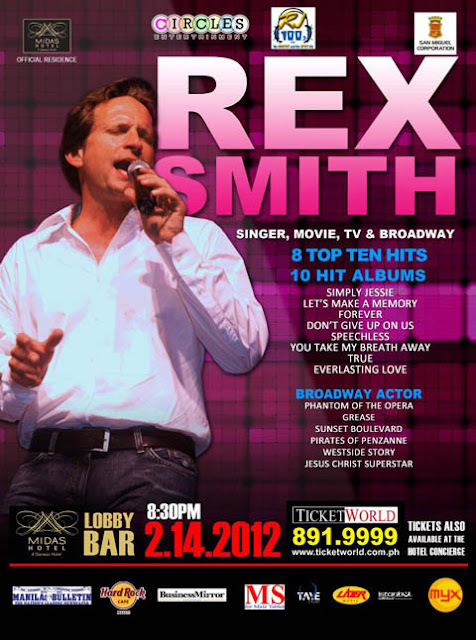 REX SMITH MANILA CONCERT LIVE Details. Concert Date is on the Valentines Day - February 14, 2012 8:30pm at Midas Hotel Lobby Bar, Roxas Boulevard in Pasay City. For Rex Smith Manila Concert Tickets call Ticketworld at 891-9999. 0 comments: on "REX SMITH Manila Concert Tickets Live on Valentines Day"